We have been farmers since 20 years, as cider works, bed & breakfast and jam producers. Our fruits come from our traditional orchards, pastured by our cows. Our ciders and pear ciders are made without added gaz and without added suggar. It is pure juice. For three generations, our family-run business has cultivated a love of orchard fruits to produce an exceptional product range. Only traditional varietes of apples and pears from our own orchards are used to produce the five AOP/AOC accredited products. We invite you to visit our cellar and orchards, and to try our different products. 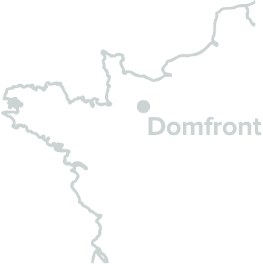 Located in a little charming valley, our farm produces Poiré Domfront, Cidre and pear and apple juice. All are organic.